If you happen to be in Seattle, then please consider stopping by my book launch for my debut picture book, Vote for Me!, TONIGHT Thursday April 5th 7:00 PM at Secret Garden Books. 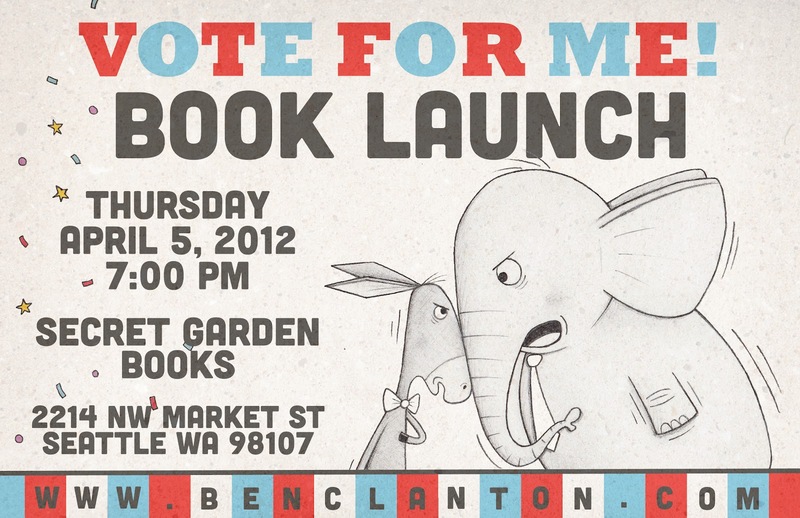 We have some fun election-themed games and activities planned for the launch party for both the young and the old. There will be cookies, buttons, pin the tail on Donkey, and perhaps a mud fight of sorts. If you do come, then come wearing either red or blue or yellow or purple to show who you support. Join us as we celebrate debut author and F.o.G. * Ben Clanton’s new book. Just in time for election season! Ben Clanton is a story scribbler, picture squiggler, book aficionado, child advocate, dragon tamer (he wishes!) and avid sock wearer (especially of the striped variety). He came to this planet in 1988 and has spent most of his time here reading, drawing, sleeping, gardening and eating chocolate. Ben is also the illustrator of the Jasper John Dooley series by Caroline Adderson. *Friend of the Garden, of course!